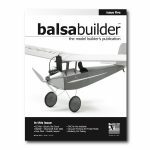 balsabuilder Quarterly – Volume 1 / Issue 4 – This is the final issue in Volume 1 of balsa builder Magazine and is heavy on construction articles with three featured builds! Those who opted for our full delivery will see their magazine accompanied with full size plans for each of the build projects. Featured full-size plans: Bang-A-Rang weekend project | 1/2A SQuiRT 3-Channel trainer | SPORTstik from WingIt! 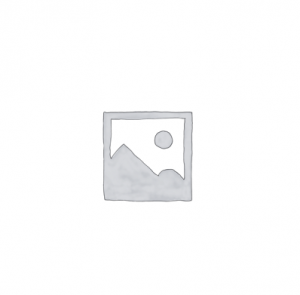 building system. 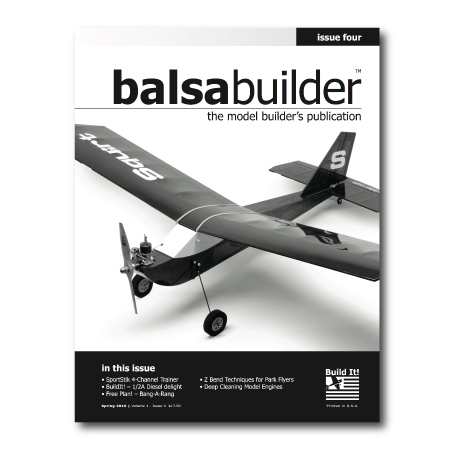 Pacemaker 100 – Prepare to be wowed by this vintage low wing polyhedral model! Excellent issue! 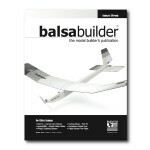 Really looking forward to the kit release for the Pacemaker 100 – stunning looking plane! I have left the magazine lying face up in a prominent location to ensure potential holiday shoppers know what I want to get for Christmas this year!